Pool filters are an important part of your pool’s system; they collect unwanted materials in your pool in order to keep the water clear. Making sure you give your filter the due amount of attention in order to keep it operating efficiently will save you time and money in the long run. 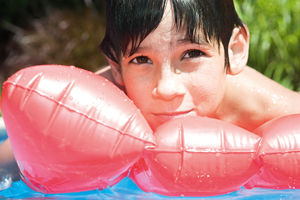 There are three main types of pool filter: sand, cartridge and Diatomaceous Earth (DE) filters. The maintenance for sand and DE filters is generally the same, but for cartridge filters it is slightly different. See below for a guide to cleaning these different types of pool filter. Sand and DE filters usually have a backwash function which reverses the flow of water through the filter to clear trapped debris. The backwash function is generally the same for sand and DE filters although it may vary slightly depending on the brand. Be sure to consult your owner’s manual before performing the procedure. Locate the backwash valve. It may be the push-pull valve, also known as a ‘side valve’, which is located on the side of the bulkhead for your filter equipment. In DE filters, pulling the plunger up will usually start the backwash process, whereas with sand filters, pushing the plunger down will perform the function. Filters with multiport valves will have a valve labelled “backwash”. Turn off the pump and open the backwash valve. Turn the pump on again until water coming out of the waste line is clear. For DE filters, run the water through the filter repeatedly for five minutes after backwashing. Add more powder to DE filters once backwashing has been completed. You should backwash your filter at least once a month. If you are unsure, consult your local pool service engineer. Cartridge filters require manual cleaning throughout the season. There are commercial cleaners available specifically to clean pool filters, but homemade solutions tend to work well without causing any harm. Follow these steps to clean your filter on a monthly basis, or as directed by the manufacturer. Add a sachet of cartridge cleaner to water using the instructions shown on the pack. Remove lid from filter housing according to owner’s manual and let the filter out. Rinse any loose debris by spraying with a garden hose. Submerge the pool filter in the bucket of water for at least one hour. Remove the filter from the bucket and hose thoroughly until clean. If there is a build up of algae on the filter you may want to consider cleaning it with muriatic acid. Be sure to take the necessary safety precautions when using the above chemicals, such as wearing protective gloves and eye wear. Always follow the manufacturer’s instructions. Do not turn on the pool pump without a filter in place. Waterco Micron Bobbin Wound Filters are manufactured from the highest grade of non-corrosive materials and are designed and built for many years of trouble free operation. Have you carried out work to service or repair your own pool filters? Do you have a swimming pool service engineer who carries out these and other maintenance and service tasks on your behalf? Let us know about your experiences in the comments box below.